Phil Strano, Senior Investment Manager at Yarra Capital Management, looks to the US market and explains why current credit market data paints a more favourable picture for Australian investors. 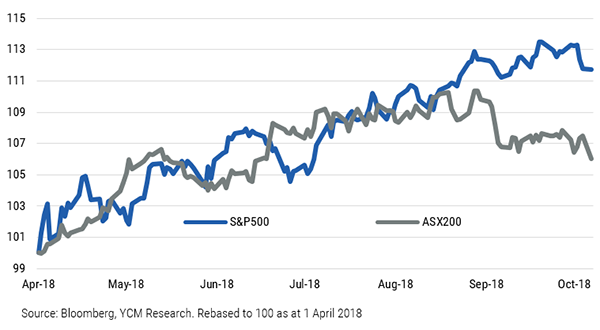 Much has been written about the recent divergence of the Australian and US markets, with pro-cyclical fiscal policy (i.e. Trump’s tax cuts) the major driver behind both the booming US economy and the S&P’s recent outperformance (refer chart 1). Lending standards have progressively loosened in the US for close to a decade. Put another way, those US borrowers at high risk of default have rarely had easier access to finance (refer chart 2). In Australia it’s a much different story: a tightening regulatory environment has seen local banks reduce exposures to riskier assets. 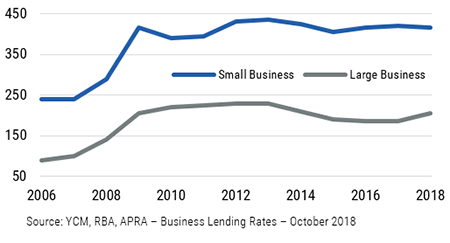 Corporate and commercial property exposures peaked at ~40% of total loans in 2007 and have declined to ~34% today, and the Financial Services Royal Commission will – at the very least – maintain a tightening bias to lending standards. 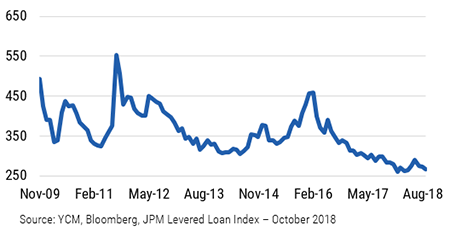 Levered loans are an important consideration since they mainly comprise loans to parties with high existing debt or poor credit histories (i.e. those with a much higher default risk). Levered loan issuance as a proportion of total US loans recently exceeded the previous peak (2007) and remains ~15 times higher since 2000. 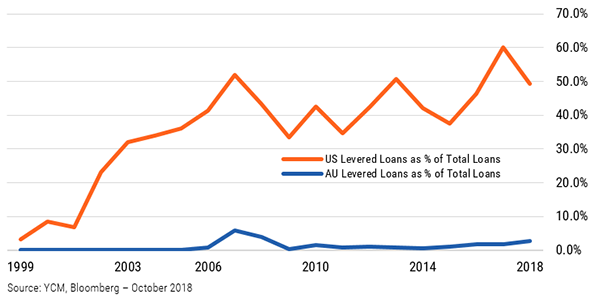 Australia, by contrast, has a much lower proportion of levered loan issuance and today sits at roughly half its previous peak (also 2007) (refer chart 3). While US loan margins have declined substantially – weighing on investor returns – they have hardly moved in Australia, a product of tighter lending standards and fewer institutional alternatives (refer charts 4 and 5). Default histories are also a concern; US defaults are 3-times those of Australia over the past 20 years (refer chart 6). With US rates rising, this trend is unlikely to reverse anytime soon. 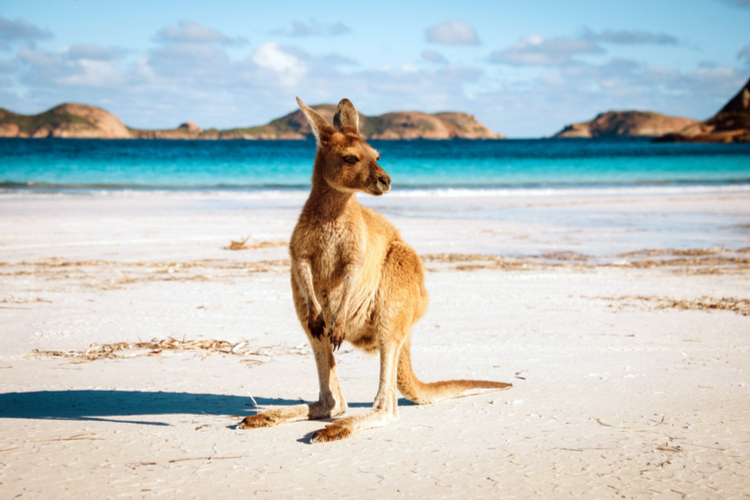 With Australia’s credit cycle in some segments significantly lagging the US, taking a multi-sector approach to Australian credit enables access to higher risk-adjusted returns than available in US portfolios offering similar risk characteristics. In addition to being bullish on the Australian private debt and asset-backed sectors, in the public markets we continue to favour credits including NextDC 2022 bonds (BBSW+~350bps) and the callable 2021 Crown hybrids (BBSW+~300bps).